Flexineb 2™ Nebulizer System for Horses. 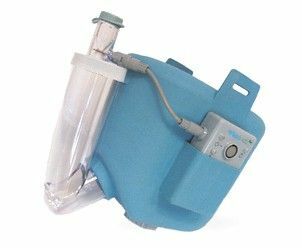 FREE GROUND SHIPPING IN CONTINENTAL U.S.
A highly portable, efficient and easy to use Nebulizer system specifically designed for horses. If your horse suffers from respiratory problems, allergies, airway irritation and inflammation, the Flexineb 2 system can help. The Flexineb 2 now comes with new circuit board and new software control. Also has an upgraded battery management feature, which makes it easier to identify when the battery must be recharged. Comes equipped with with Automatic Tuning (AMT). The new Flexineb 2 has the ability to change the number of vibrations per second. The system is economical and very easy to use. Sets up in minutes. Contains no hoses, cords or bulky valves. Since it is made of flexible yet sturdy plastic, it will fit comfortably on the horses nose. Works fast, 10 milliliters saline areosolized in less than 12 minutes. The compressor operates silently which helps keep your horse calm. Can be adapted for use with metered dose inhalers. The re-chargable lithium-ion battery lasts up to 3 hours. Cleaning is easy, just wash with warm, soapy water. The Flexineb 2 has proven itself useful when nebulizing antibiotics, bronchodilators, corticosteroids and mucolytics. Please note that medications are NOT included and must be ordered through your vet. Please follow your vet's advice at all times. Includes a standard 10 ml medication cup as well as A 20 ml extension to facilitate volumes of up to 30 mls. No medication remains in the cup after treatment. Flexineb™ 2 is designed to fit comfortably onto the horse’s nose. 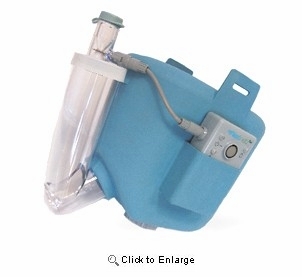 An adjustable control allows full control of the exit valve, enabling the caregiver to bypass the valve for easy breathing or to facilitate inhalation deep into the lungs.